Keswick View 4-star self-catering holiday apartments lie in the heart of Keswick, convenient for all amenities and with great fell views. Our three modern apartments each accommodate up to 4 guests and are equipped to a high standard, including free wi-fi. Our private car-park allows you to enjoy Keswick without worrying about parking fees. Keswick View is on pedestrianised Lake Road, close to the Market Square. An excellent choice of restaurants, shops and pubs are available on the doorstep and the cinema, theatre and Derwentwater lake are a short stroll away. Each apartment has a comfortable lounge with TV/DVD, a double (king-size) bedroom and twin bedroom, bathroom, and modern kitchen with dining area. The upper two apartments (Whinlatter and Castlerigg) also have ensuite shower rooms and enjoy fine fell views of Catbells and Newlands Valley. 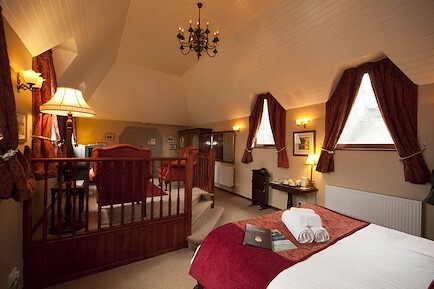 Castlerigg can also accommodate a fifth guest in a Z-bed (small charge; bedding provided). The Garden apartment has level access from the car park to the rear of the property and into town, particularly suiting those with mobility difficulties or young families. Its lounge and private sun-lounge overlook our patio with outdoor table and chairs. We welcome walkers and cyclists. The apartments share a useful drying/laundry room, equipped with a front-load washing machine and tumble dryer, plus boot rack and hangers to dry wet clothes. See our website for photos and further details of the apartments and facilities. All tariffs include bedding, heating and electricity. Towels available for a small charge. Our weekly changeover day is Saturday. Short breaks are available outside peak periods. These are usually Mon-Fri or Fri-Mon. We are flexible: call or email us to discuss other options or visit our own website (www.keswickview.co.uk/availability) to book short breaks. We have a no smoking/no pets policy. Children are welcome: prior arrangement required for very young children. Complimentary high-chair and cot available (pre-book; bring own bedding). Larger parties of up to 12 people (13 with z-bed) can stay by booking two or three apartments. Keswick View is quality assessed by VisitEngland: all apartments are graded 4* and the property is 'Walkers Welcome' and 'Cyclists Welcome' accredited. We are members of Cumbria Tourism and Keswick Tourism Association. Keswick View lies in central Keswick, on pedestrianised Lake Road between George Fisher's outdoor store and the Market Place. Its private car park is located to the rear of the property. Keswick View is ten minutes walk from the bus station. Your enquiry will be sent directly to Keswick View. Please fill in as much detail as you can.